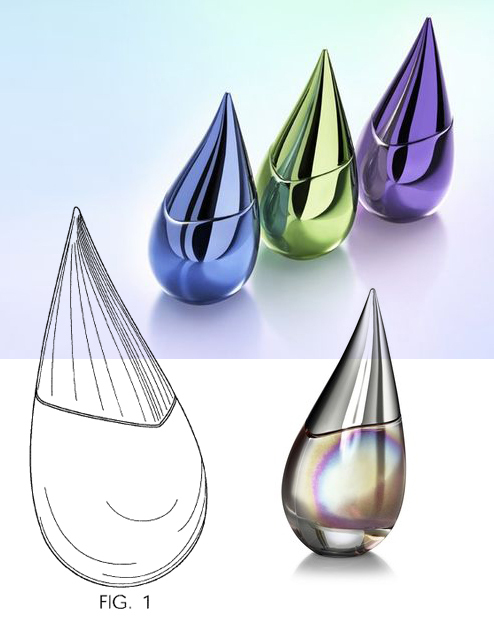 Droplet shaped bottles: while plenty of bottles are generally teardrop shaped, there are some bottles specifically designed to resemble a droplet of liquid. Here are six of them in no particular order…. 1. 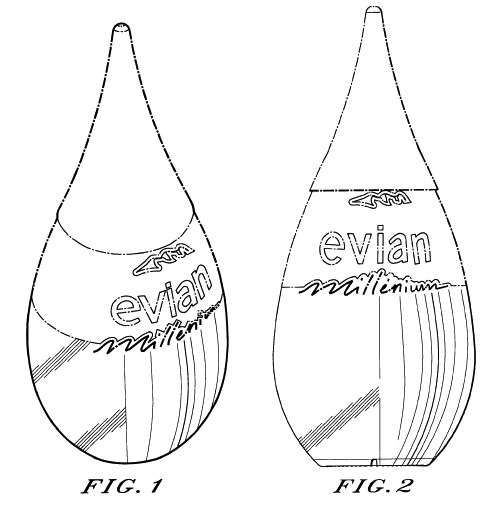 The design patent for the Evian “Millennium” water bottle was filed in 1999 by Dominique Vignon. It was used as a limited edition pack from 2000–2004. 2. 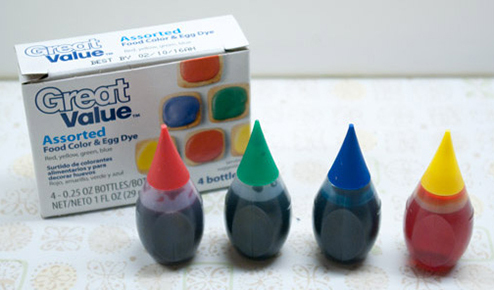 Small droplet-shaped plastic squeeze bottles have become a generic container for food colorings, but McCormick & Company was the first. A vintage green food coloring bottle is now available on eBay for $9.99. 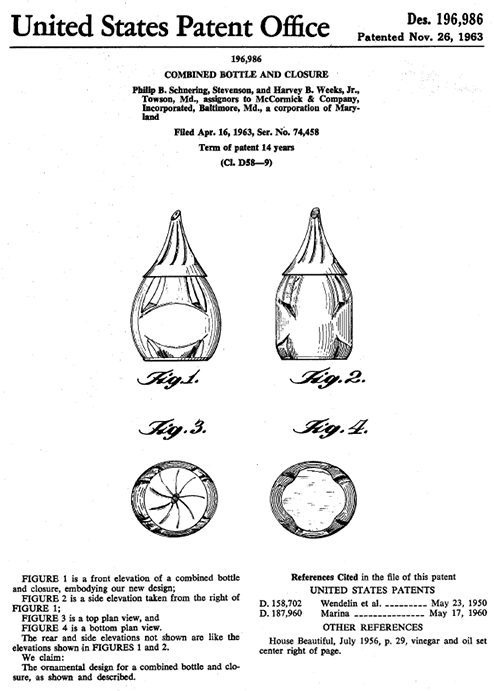 The 1963 design patent for McCormick’s droplet-shaped glass bottle is shown below. 3. The “Wanted by Jesse” bottle, designed by First American Brands. The “inspiration” for its tear-drop shaped is reportedly Jesse McCartney’s audience, and their propensity for crying tears of joy. 4. 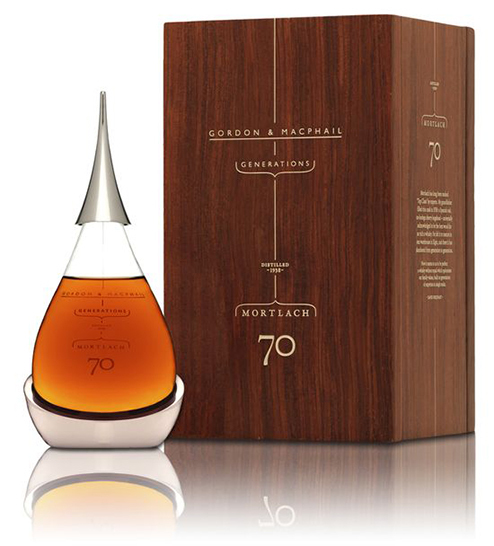 The teardrop-shaped decanter for Glenlevit’s 70-year-old ($21,000-a bottle) whiskey was designed by Glencairn Crystal. 5. RPC Group created the new teardrop shaped “tottles” for Vosene in 2012. 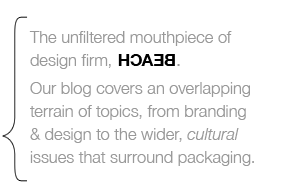 Focus groups can serve a valuable purpose for pack designers and brands. 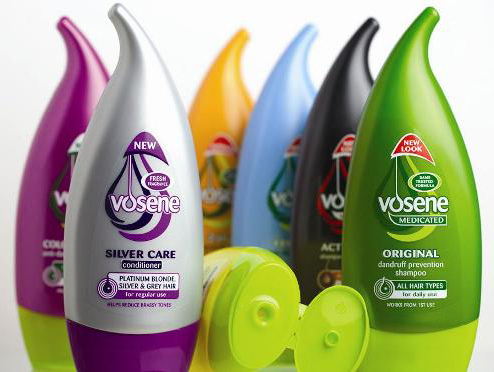 For Lornamead, the consumer panel gave it a clear steer on the new look packaging for its hair care brand Vosene. 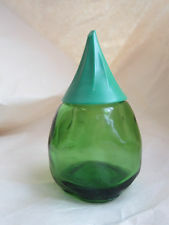 The shape of the shampoo bottle resembled its teardrop motif and older members of the panel knew the reference and correctly identified the brand. “We knew we were onto a winner,” recalls Rob Hunt, sales manager at RPC Llantrisant, which worked with Lornamead to create the plastic bottles. … around 10 designs were created with the general consensus settling on the teardrop shape. “I refer to it as a Smurf’s hat,” adds Hunt. 6. ‎The design patent for La Prairie’s droplet shaped “Silver Rain” bottle was filed in 2005. The perfume is named after an environmental phenomenon in Switzerland, the home of La Prairie which began as an exclusive clinic specializing in anti-aging therapy, where rain falling on alpine glaciers turns into ice crystals known as silver rain. 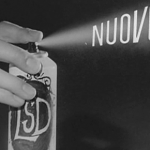 To echo this, the fragrance is packaged in a raindrop-shaped silver bottle.